Who Was the First White Knight? In this season of remembrance for those who fought and died in wars and battles, it is worth commemorating Whiteknights’ very own White Knight – the first on record. 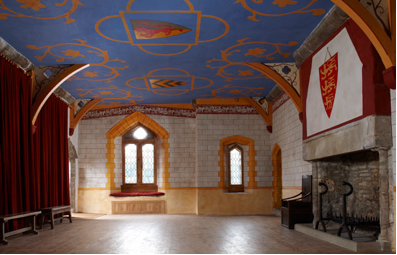 He was John of Earley, who served in the army of Edward I in the 1290s, and was supposedly given the name both for his appearance and his chivalrous behaviour. His manor at Earley (now the site of the University of Reading’s main campus) came to be known as Earley Whiteknights after him. This John of Earley inherited his land while he was still a child, and both he and his manor were placed by King Edward I under the guardianship of St Thomas Cantilupe, Bishop of Hereford, who needed a base near Windsor and London. 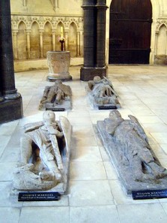 Thomas himself had had an adventurous career, having been a supporter of the rebel and reformer, Simon de Montfort, who appointed him Chancellor – though Thomas was forgiven by Henry III and Edward I. However, John needed little inspiration to become a hero, since he came from a family of them. The founder of his dynasty was another John of Earley, the twelfth-century ward, squire, companion and knight of William the Marshal. John accompanied the Marshal in battle, was present at his deathbed, and contributed to the poetic History of William the Marshal. It is the History of William the Marshal which also preserves information about John, including a heroic speech urging the Marshal to win outstanding honour and glory (as indeed he did) by fighting for the rights of the child-king, Henry III. Late in his career John became seneschal of the Marshal’s great castle at Chepstow, as well as marshal of the royal household and joint seneschal of Leinster. His close association with William the Marshal suggests that John too supported the Great Charter (Magna Carta), signed by John in 1215 and re-issued by the Marshal. It is possible that this John of Earley bore a shield showing three white scallops on a field of red. Such a shield was found amongst wall-paintings at the entrance to the great hall of Chepstow Castle, and occurs also in images of knights fighting for King Richard I. Best-known of these is one found in a fourteenth-century copy of the Chroniques de France now in the British Library (Ms Royal 16 G vi). 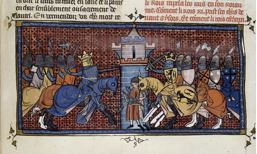 A miniature on folio 360 shows Richard I in battle against Philip Augustus – and one of Richard’s knights is carrying a shield which appears to have three white scallops on a red (or gules) field. Thus, whilst the first ever White Knight was actually the John of Earley who lived and fought at the end of the thirteenth century, his predecessor and namesake provided a role model! Now it would be good to hear from Fine Art, with images of Reading’s White Knight (with or without scallop shells)! This entry was posted in Anniversaries, Medieval History and tagged ‪#‬RemembranceDay, ‪#‬WhiteKnight, ‪#TowerPoppies‬. Bookmark the permalink. 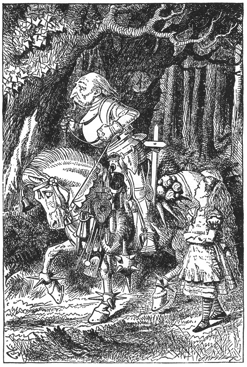 1 Response to Who Was the First White Knight?